Feeling awareness and feeling measurement are major #EmotionalIntelligence skills. The more you help your children identify and rate what feelings are visiting them, the stronger their ability to deal with appropriately with all mad, bad, and sad feelings. Use this feeling thermometer to aid your efforts. This blog post inspired by this Daily Prompt: Mad as a Hatter Tell us about a time when you flew into a rage. What is it that made you so incredibly angry? This is an area where modeling works best. That means of course, you need to be aware of your feelings and able to measure them. Then you need to share that knowledge with your children. The sharing should start when the child has mastered talking. You can get a digital copy of this feeling thermometer free at the EFTI Store. Download it and post it where you will see it throughout the day. 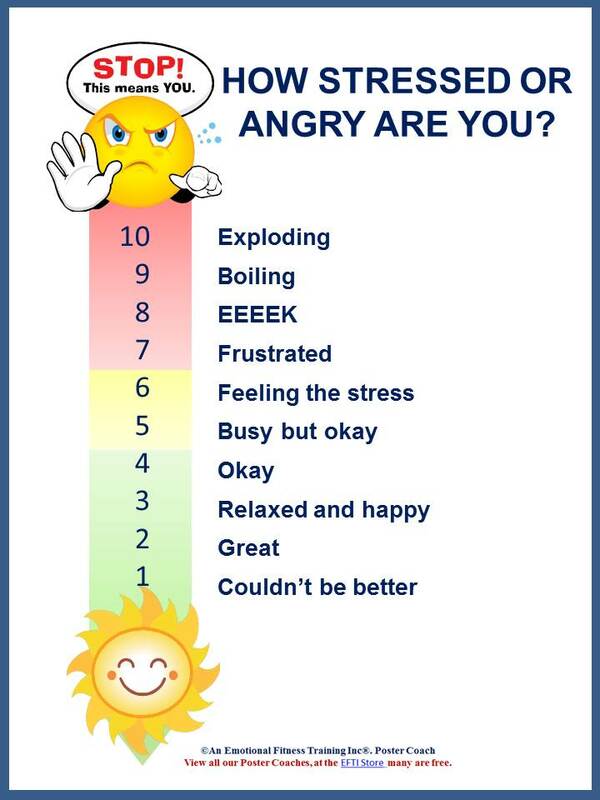 Every time you see it, take a calming breath, then name and rate what you are feeling using this feeling thermometer as a guide. When stress and anger are building, take a mini-time out to self-sooth. Check out these Emotional Fitness easy self-soothing exercises; they will help you keep your cool. As always practice caring, be grateful for what you have been given, forgive yourself and others for failing to be all that is good as you continue to practice kindness and bring forward a more just world for all. EFTI’s POSTER COACHES: Most EFTI posters posted on EFTI’s blog can be obtained at the EFTI Store. Many are free. This entry was posted in Parenting Issues and tagged Emotional fitness, Emotional Fitness Training, Emotional Health, Feeling measurement, Feeling thermometer, Katherine Gordy Levine, parenting, Parenting advice, parenting tips, parents, postaday, Self-care, stress. Bookmark the permalink.